Al-Quran digital ini merupakan aplikasi yang menyerupai fisik Al-Quran yang dapat dijalankan didalam komputer, aplikasi ini untuk membantu anda agar dapat membaca kitab suci ini dengan mudah, pada saat waktu kosong. Bagi anda yang sibuk dan kerjaannya selalu dihadapkan dengan komputer, pasti anda tidak sempat untuk membuka Al-Quran, mungkin banyak yang berpikir bahwa sekarang sudah ada Al-Quran kecil atau Quran yang terdapat pada aplikasi HP. Tapi itu semua ada kelebihan dan kekurangan, contohnya tidak semua orang dapat membaca tulisan arab yang kecil. Dengan aplikasi ini diharapkan bisa menyelesaikan masalah anda selama ini. Tampilan aplikasi ini sangat mudah untuk dipelajari, anda bisa atur posisi sesuai dengan keinginan anda. Bisa diperbesar atu diperkecil dengan begitu memudahkan anda dalam membaca. Anda juga dapat menentukan halaman yang ingin anda baca. Aplikasi ini sudah portable, jadi anda dapat menggunakannya di PC/Laptop manapun tanpa harus meng-instalnya, tinggal jalankan file exe-nya saja. Pasti di PC anda punya beberapa converter, seperti converter video, musik, ataupun gambar. Dengan Format Factory anda hanya membutuhkan satu converter, untuk memenuhi kebutuhan converter anda. Format Factory merupakan software All in one Converter yang sangat powerfull, dan yang paling penting lagi software ini bersifat free. Jadi anda tidak perlu lagi memasukan serial atau cracknya. Format Factory dapat mengconvert semua file video menjadi MP4/3GP/MPG/AVI/WMV/FLV/SWF, sedangkan untuk audionya dapat mengconvert menjadi MP3/WMA/AMR/OGG/AAC/WAV, dan untuk file gambarnya software ini dapat mengconvert menjadi JPG/BMP/PNG/TIF/ICO/GIF/TGA. Format Factory juga dapat Rip DVD to video file , Rip Music CD to audio file. Penggunaan Format Factory sangat mudah, pertama anda hanya tinggal pilih menu apakah anda inging meng-convert video, music, atau picture. Kemudian anda tinggal pilih format dari output-nya. Setelah itu anda tinggal klik tombol start, format factory juga dapat men-convert file lebih dari satu secara bersamaan. Selain itu dengan software ini anda juga dapat menggabungkan video dengan file subtitle-nya. Untuk menggabungkan-nya anda tinggal klik tombol output setting, kemudian pilih additional subtitle dan anda tinggal browse file subtitle-nya. By means of the given set of antiviruses-scanners you can check up your system on presence of viruses. All programs work without installation, from any replaceable carrier. The given set covers all spectrum of virus dangers. VueScan Professional Edition,the world's most popular scanner software, is used extensively by photographers, home users, scanning services and corporations. VueScan is a scanning program that works with most high-quality flatbed and film scanners to produce scans that have excellent color fidelity and color balance. It is very easy to use, and also has advanced features for restoring faded colors, batch scanning and other features used by professional photographers. VueScan changes nothing on your system, installs nothing in your operating system and all other scanner software will continue to function. VueScan increases your productivity and saves you money. VueScan has advanced scanning options, powerful features, and greatly improves your scans with superior color accuracy and better color balance. VueScan supports more than 700 scanners and 209 digital camera raw files and takes about 5 minutes to download and install. Its wide range of filters allows novice users to familiarize themselves with the world of graphics.You can find the standard adjustment functions (Brightness, contrast, dyed, saturation, gamma correction) and also artistic filters (watercolor, pastels, Indian ink, pointillism, puzzle effect). PhotoFiltre Studio uses two types of vectorial selections. The first type uses automatic shapes(rectangle, ellipse, triangle, rhombus, rounded rectangle). The second type corresponds to the lasso and polygon. They both allow a customized form by drawing a shape by hand or using a series of lines. Every selection can be saved into a seperate file, to be used later on. PhotoFiltre Studio has some standard brushes (round and square in different sizes), but also some more varied forms (Oblique line, custom shapes, ...). The Rainbow option lets you draw a gradient along the line. More effects than 3D, Pastels and Charcoal are available too. Core FTP Server is a secure FTP server with SSL/TLS/FTPS, SSH/SFTP support virtual paths, access rules, certificate authentication and more. Core FTP Server has an easy application that will allow users to start sharing files in just a few minutes. Utility is designed to properly remove the installed programs. The first step in the Total Uninstall, is monitoring changes in the system during the installation of new software. A snapshot file system and registry prior to the installation of an application and after. In the future, based on the collected at the time of installation of data (images before and after installation), a utility for quickly and help you remove unwanted program. As you can see, everything is quite simple. In the Total Uninstall interface is not congested, all the steps set through dialogues. Summarizing, we can say that this is a useful tool if you are constantly installing and carry the software. • Clean Uninstaller - Used for both correctly removing software and for monitoring changes made to the hard drive, MS Windows registry and system files during program installations. • Scan Files - Used for periodic cleaning of your hard drive from dead references, junk and obsolete files produced by different software. These files and references remain on the hard disk and increase drive access time. • Scan Registry - Used for periodic cleaning of the MS Windows registry from unused applications remaining after uninstallation and from invalid references which decrease system speed and system loading time. • Start Up Manager - This tool allows you to monitor, add, remove, enable and/or disable individual startup items. You can also adjust applications initialized during the loading process of the operating system. • Tweak UI - This is a set of additional adjustments related to safety, system capacity and user preferences and which are not included in the basic components of MS Windows. • Net Tweaker - The tool is used for speed increasing of data transfer and for greater stability of connection by changing hidden network settings. Available only in “Professional” edition. • The Privacy - This is a kit of tools which ensure your privacy and keep sensitive information secure. It consists of three basic parts: “Objects to Erase”, “Invisible Man” and “File Shredder”. Available only in “Professional” edition. • Invisible Man - This tool is used for saving private information and its later restoration. This is useful if you don’t want any information saved by the system. • File Shredder - This tool is used for secure deleting documents, programs, and any other files without possibility to restore them. • Memory Booster (free) - This tool serves for monitoring, cleaning and optimisation of RAM. It is used for increasing of operation system performance and for releasing RAM for usage by other processes. If you have a possibility, we recommend to use “RAM Saver Pro” instead of “Memory Booster”. SKDownloader is one of the modern and perhaps the best of its kind, a download manager that allows downloading any files from your favorite fayloobmennikov with an unlimited number of threads. Also in the program has a function of acceleration, allowing times to increase download speeds by optimizazii network settings and increase the capacity of virtually any compound. The program is very easy to operate and requires no user intervention. SKDownloader provide you with fastdownloading of any files, saving you time and money. on your PC. This is a great way to restore your long forgotten Windows Live Hotmail® password. messenger you're able to login automatically without entering your MSN password. About the program: SecureUninstaller ™ program to uninstall installed on your computer software. SecureUninstaller - uninstaller programs with well-organized interface and the algorithm works. This utility tracks and records the changes that make installation program, which allows to correctly remove unwanted program. Positive quality is that this program removes not only the applications that were traced to her, but by analyzing the uninstall program, and monitoring are not produced. SecureUninstaller ™ is your best bet at thoroughly removing any unwanted software from your PC. This includes 'hard-to-get-rid-of programs' that the standard Windows ® Add / Remove Program feature can't seem to uninstall from your system. Unwanted programs put a big strain on your computer's resources. They occupy valuable disk space, which slow down your system. And if you try to uninstall them and they are not meticulously removed from every nook and cranny of your PC, these 'traces' pose a security threat to your system. SecureUninstaller ™ accurately detects all the programs you have installed on your computer. This includes programs that you may have tried to uninstall before but was never 100% removed from your system! This level uninstalls programs using the Add / Remove Programs function of Windows ®. Recommended for: simple, straight-forward applications; however, unlike the Windows ® feature, backups will be made for any application removed (great for programs that you are not using now but may want to use at a later time). This level will uninstall software by scanning the most common locations where application traces and left-over data usually reside. Recommended for: advanced software, ie, programs that perform numerous tasks or has plenty of features; ANY program that Windows ® Add / Remove cannot remove. This level follows a deep-level, heuristic uninstall procedure. It will thoroughly search your complete hard disk for any program traces. Recommended for: advanced software; ANY program that Windows ® Add / Remove cannot handle; ANY program that is damaged or corrupted. SecureUninstaller ™ applies a special heuristics approach to removing software from your computer. Based on our knowledge of the Windows ® operating system and install and uninstall procedures of thousands of applications, we have built SecureUninstaller ™ in such a way that it methodically goes over every nook and cranny of your hard disk where software files and entries may have been placed during installation. Get rid of ANY unwanted software instantly without even having to open SecureUninstaller ™! Simply right-click an application and click Secure Uninstall and our program will do the rest. Waste time no more. SecureUninstaller ™ removes programs thoroughly in minutes! Every application you try to uninstall will be backed up. If ever you want to, you can restore the original files and install the program again. For added security, you can create a Windows ® registry backup prior any un-installation; restore these registry backups any time. - PROGRAM UPDATES FOR LIFE! SecureUninstaller ™ We believe that it's OUR responsibility to provide you with the LATEST version of our program at all times. When you launch SecureUninstaller ™, you will be asked to download the latest version of ourapplication IF we deployed a new one. You will be benefitting from TONS of amazing and exciting features we cook up! SecureUninstaller ™ applies a 24-hour response policy. Every inquiry you make is guaranteed to be replied to by one of our professional, courteous - and yes, human - customer service professionals. RDesc and FreeRapid are two popular desktop clients for downloading HotFile.com files in an automated fashion with minimal user interaction, a new utility has now came-up offering fully automated file downloading for Hotfile free users - simply load the hotfile download links in the software and files will download one-after-another finishing all loaded links without any further user interaction. The free utility requires "Microsoft .NET Framework" to get working and does not support Captcha recognition, so users will be able to download files less than 150MB only. 1. Download a group of links from Hotfile.com (one by one). 3. Load and save the download list. Total Power Control - TPC puts at your fingertips a well laid out, easy to use tool that will help you get your work done quickly and easily. No more crawling around and clicking through layered menus. TPC Provides functions Microsoft left out. Due to intelligent design and layout, both novices and power users will be totally comfortable using TPC. * Access any power plan with two clicks - power saver, balanced, high performance or any custom power plan. * Two clicks to shutdown, restart, hibernate, sleep, screen off, logoff, lock workstation, switch user, run screensaver and more. * Timer, CPU Load and Hotkey Managers can execute any power-related function as well as start any user applications. * Timer Manager executes specified action based upon system clock. * CPU Load Manager executes specified action when CPU load reaches specified idle level. * Hotkey Manager executes specified actions from the keyboard even when TPC is not visible. * Battery Charge State meter reports current charge state of laptop battery. * Advanced commands allow you to force a shutdown when your PC will not respond to the Windows shutdown button. * Always-on-top CPU load meter puts CPU load information on your desktop. * Built-in web server allows sending commands over internet or local network to shutdown or restart computer. * Create JPG or BMP screenshots using custom hotheys or make timed sequences of screenshots. * Command line support for all power actions. Display real time network traffic speed for each computer in network. Display all active network application on any computer in network. Display all sessions and listening ports for any active network application on any computer. Display application properties and loaded modules. Support "Internet Connection Sharing (ICS)", can monitor network usage of ICS clients without install agent on those client. Can monitor NETBIOS file transfer, which is local network shared file copying. Use "WHOIS" service to get detail information on remote IP address and domain names. Integrated system firewall and application firewall. Support rules on applications, IP address/port number, DNS names, protocol type, and even HTTP URL. Rule-Exception mode rule structure for easier setup and understand rule relations. Support rule schedule, can specify the effect time range for each firewall rule. Fast firewall engine which can handle thousands of rules. Detect and block port scan, SYN flood, DOS attack. Stealth mode to hide your computer from hacker. Limit data transfer speed for each computer on network, and further each application, remote IP address and connection. Support speed limit rules on applications, IP address/port number, DNS names, protocol type, and even HTTP URL. Support rule schedule, can specify the effect time range for each speed limit rule. Unique "throttle priority" feature enable you giving critical application or remote site more bandwidth. Live capture network packets for any active network application or session. Support pre-defined capture, using capture filter to capture packets on defined applications and remote address. Associate captured packets with session logs, so can browse captured packets while browse logged sessions. Support exporting captured packets into TCPDUMP format, so can be further analyzed using third-part tools. oShow Producer was designed for professionals who are creating shows commercially. An impressive list of creative features and options available only in Producer allow advanced, professional-looking results unmatched by consumer software. Manage difficult deadlines. Productivity-boosters like show templates and settings-copying cut production time. Take the guesswork out of media authoring. Output to DVD, EXE, Flash, QuickTime, HD Video and more! DAP (Download Accelerator Plus) memang dapat mempersingkat waktu download di banding jika menggunakan tool download bawaan browser, bahkan waktu download nya dapat ditingkatkan hingga 400% ,tapi bila koneksi sedang drop ya minimal ngga parah banget gitu,selain itu saat koneksi putus DAP masih mampu meneruskan proses download kita. Untuk browser Internet Explorer dan Opera, DAP dapat berfungsi dengan baik tanpa masalah. Namun, bagaimana jika DAP tersebut tidak bisa berjalan otomatis pada browser khususnya Firefox saat mengklik option download. 2. Buka folder 'Program File\Dap' di drive C.
3. Cari file 'dapop.dll'. Pilih file tsb lalu klik 'Edit | Copy'. 4. Buka folder 'C:\program File\Mozilla Firefox\plugins'. 5. Taruh file 'dapop.dll' difolder ini dengan klik 'Edit | Paste'. 6. Ubah nama file 'dapop.dll' menjadi 'npdap.dll'. 7. Restart DAP dan firefox. Nah nantinya secara otomatis proses download akan di ambil alih Oleh DAP. DAP (Download Accelerator Plus) Free Version. Download Direct - (also known as DLD) was developed to accelerate file downloads from the Internet to 500%. The program interface is very simple, but rich in the program settings, and in addition to ordinary file uploads can shake off the network Torrent, along with swings and mirrors well as assuring the integrity of the file - after downloading the files to check bitost. - Accelerating the various connections. - Find the file mirror. - Preview the file during the download. - Automation of tasks for events. - Automatic repeat on error. - Unlimited number of simultaneous uploads. - Easy to use graphical interface. - Restore download after an error. Remote Office Manager is a program for administering and controlling computers remotely in local area networks and wide area networks. It allows you to remotely access the computer desktop in real time. You see the remote computer screen in a resizable window and can control the remote computer with your mouse and keyboard. ROM is compatible with Windows 7. Remote Office Manager (ROM) provides fast, safe and comfortable remote access to computers and supports LAN and WAN (Internet) connections. Besides mouse and keyboard control, ROM offers a number of other tools useful for a system administrator, for example, file transfer, a task manager, remote launch, capturing sound from the remote computer and much more. Despite its multiple features, Remote Office Manager uses minimum memory, saves CPU resources and can also be configured to run in low bandwidth networks (via EDGE, GPRS) due to its features of running in the so-called saving mode. All data sent over the network are compressed and encrypted. • Complete compatibility with Windows 7. • High performance in both local area and low bandwidth networks. • A lot of features - file transfer, task manager, device manager, Wake On LAN and much more. • Remote installation. There are several types of remote installation available, including installation in a domain, using a group policy and MSI. • Multi-monitor system support. If the remote computer has several monitors, ROM allows you to view or control them simultaneously in one window or switch to the necessary monitor. • Security. All data is encrypted with the help of up-to-date technologies and public key protocols (RSA with a 2048-bit public key and AES with a 256-bit session key). • Network map. It allows you to arrange computers on the network map showing their actual topological location. • Configuring the program for running in case of a complicated network topology due to such features as "Connect through" and "Callback connection". • ROM is deeply integrated with the drag-and-drop mechanism of the system. You can drag and drop files and folders directly onto the remote screen window and from it, which makes working with files as easy as possible. The file transfer mode also completely supports this mechanism. • Capturing sound from the remote computer. • Supporting an unlimited number of simultaneous connections. CorelDRAW - The official version of the graphical package CorelDRAW Graphics Suite X4. It is composed of the editor of vector graphics CorelDRAW X4, raster graphics editor PHOTO-PAINT X4, the program for transforming raster images into vector Corel PowerTRACE X4, the program for creating screenshots Corel CAPTURE X4, as well as e-book to work with the package CorelDRAW Handbook. The DVD also recorded more than two hours of training lessons on working with software package. TextMaker Viewer allows you to open, read and print documents from Microsoft Word, OpenOffice and TextMaker.TextMaker enables to view documents without the appropriate application. So you can open documents from Microsoft Office without the expensive Office Suite. Layouts are presented correctly and you can copy the text into the clipboard to edit them in some other programs. Tipard Total Media Converter is universal DVD and video file Media Converter. It is really advanced media file conversion utilities for you to convert DVDs, or videos (including M2TS, MTS, TS, HD H.264/MPEG4 AVC...), audios, then sync to your mobile players, like iPod, iPhone, PSP, Zune, Creative Zen, other MP4, MP3 players and so forth. To satisfy your requirements, Tipard Total Media Converter assists you to effect your DVD/video media file by adjusting the Brightness, Contrast, Saturation. Trim, Crop, Watermark your video when you convert your media file. Also Merge your several files into one by merging your selected files with the assistance of Tipard Total Media Converter. And more particular ways to upgrade your DVD/video media files, like Settings, Audio Track, Subtitle, Snapshot.. The videos or audios converted by Tipard Total Media Converter are compatible with most players, like iPod, iPhone, iPhone 3G, Apple TV, PSP, PS3, Wii, Zune, Zune 2, Xbox, Xbox 360, Sony Walkman, Archos, Creative Zen, iRiver, BlackBerry, BlackBerry Storm, BlackBerry Bold, Palm Pre, Motorala, LG, Sony Ericsson, Mobile Phone, etc . Tipard Total Media Converter owns the basic way to convert all kinds of videos, including all popular SD video(MP4, MKV, 3GP, WMV, MOV, FLV, AVI...), HD video(HD M2TS, MTS, TS, HD H.264/MPEG4 AVC..) to your portable players or other devices. Powerful Total Media Converter acts DVD Converter solution to convert your DVDs for compatible with your players or devices. It is possible with Tipard Total Media Converter to take out audio from DVDs or videos just by selecting one audio formats from drop down Profile menu. General audio formats, like AAC, AC3, AIFF, AMR, AU, FLAC, MP3, M4A, MP2, OGG, etc. Adjust the DVD/video Brightness, Contrast, Saturation to your desired video quality. Using "Trim" in Tipard Total Media Converter to get any segment of your DVDs/videos, then output to your players; Using "Crop" to get your devices best suited play region; Using "Merge" to obtain one successive videos for your enjoyment. Tipard Total Media Converter lets you watermark your video by adding Text or Picture watermark, also owns the way to adjust the watermark position in Vertical, Horizontal angle. Even adjust the watermark Transparent. Amazing Photo Editor is a powerful and easy-to-use photo editing software used for photo editing, viewing and converting. 33 amazing effect filters are included! You can edit several photos at the same time,for Amazing Photo Editor is designed in MDI (Multi-Documents Interface). You can open and edit photos in your hard disk,or acquire photos from the scanner. A screen capturer is included too. You can export the photo to file, printer, or send it to your friends by Email. Beside the basic edit function, Amazing Photo Editor has lots of ability to process photos, such as resize, rotate, adjust color, mirror, insert text, negative, gray scale, intensity and so on. Amazing Photo Editor has 33 effect filters (Bleed, Blur, Bump, Curl, Edge, Engrave, Enhance, Extrude, Fade, Wave... and so on), 10 effects (Noise, Balance, Lighten and so on) and 4 photo optimization (Auto Smooth, Gussian Blur and so on) which will make photos more pretty and suitable for your need. They are so powerful that you will find how useful and helpful they are! Secondly, Amazing Photo Editor is not only a photo editor but also a graphic converter. It can read 53 image formats and write to 27. It displays information of photos. Amazing Photo Editor has the function of batch conversion which converts lots of photos at a time. It will save you time and energy. Deep Freeze instantly protects and preserves baseline computer configurations. No matter what changes a user makes to a workstation, simply restart to eradicate all changes and reset the computer to its original state - right down to the last byte. Expensive computer assets are kept running at 100% capacity and technical support time is reduced or eliminated completely. The result is consistent trouble-free computing on a truly protected and parallel network, completely free of harmful viruses and unwanted programs. While Deep Freeze provides bulletproof protection, its non-restrictive approach also improves user productivity and satisfaction. Placing no restrictions on a user's ability to access all system resources, users avoid the frustration of downtime due to software conflicts, operating system corruption, virus attacks, and many other problems. Users are always assured of computers that are consistently operable and available. Game Booster is designed to help optimize your PC for smoother, more responsive game play in the latest PC games with the touch of a button. 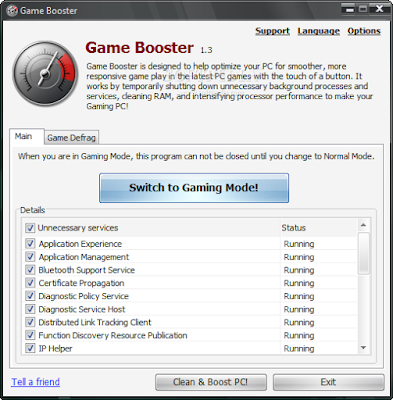 Game Booster helps achieve the performance edge previously only available to highly technical enthusiasts. It works by temporarily shutting down background processes, cleaning RAM, and intensifying processor performance. That means you can keep all the features of Microsoft? Windows Vista? and XP? ready for when you need them, but turn them off when you are ready to get down to serious business - gaming. Game Booster makes it simpler to enjoy the latest games and take your experience to a new level. All systems go! * 1 Click - Game Booster is extremely easy to use. * Speed up Game Play - Gives more CPU and RAM to your games. * Increase Gaming Stability - Prevents and avoids possible cocnflicts and incompatibility. * Safe, Security, and Free - Game Booster does not overclock your hardware, does not change your Windows Registry and system settings. Game Booster is 100% freeware, without any virus, adware, and spyware. FLV Converter Plus - a program for searching, downloading and converting video to FLV format with such popular services like Youtube, Dailymotion, Google Video, Yahoo Videos, MetaCafe, Veoh, megavideo. Allows you to search for videos without a browser, as well as available instantly view video found using built-in player. Pomimo search, download and view the video, the program allows you to convert video from FLV format to the formats AVI, Ipod, iphone and psp. And she kzhe using FreeFLV Converter you can easily convert any video files (divx, xvid, mpeg, dvd, avi ...) in the format FLV (Flash video) with automatic creation of HTML pages, you will only publish the files in their own site and your video will be available in a convenient format to the public. Search and download videos for free from Youtube, Dailymotion, Google Video, Yahoo Videos, MetaCafe, Veoh, megavideo ... You can preview the videos and download them in AVI, iPod, PSO, iPhone, 3GP or FLV (flash) formats. This software can also convert all your videos (divx, xvid, mpeg, dvd, avi ...) to FLV video (Flash video) with an automatic HTML page creation. You will only have to place the files on your website to share your videos with the entire world. Compatible with more than 500 video websites. Photo Frame Studio is designed for editing and finishing of digital photos. Work in the program will bring a lot of fun. We offer over 200 frames, each of which can be modified using the tools contained in our program. The program interface is very convenient, because it was made so that it could work with any user. Photos can prepare and arrange with the help of several teams, adding frame, mask, background or text. Using all these functions and effects, and considering that all of these elements can be used simultaneously, including changing the color of individual layers, the intensity or contrast of the image, we can say with certainty that all pictures will be unique. In addition, you can design your own composition. This opportunity provides the tools insert arbitrary elements - shapes, graphics, and spectacular titles. You can also calibrate the picture, that is to cut them or arbitrarily to approximate the image, as well as to remove the effect of 'red eye'. and preserve photos with a small resolution to publish them on Web sites. * Works with formats such as jpg, bmp, wmf, png, tiff, etc. * Use dozens of effects to work with objects (text, images, background), for example, the shadows, sepia, gradients, texture, etc. * Multilingual interface: (English, German, Portuguese, Spanish, Italian, French, Norwegian, Swedish, Polish, Czech, Russian, Bulgarian, Persian, Chinese, Romanian).